As revealed during the PlayStation Experience last weekend, Square Enix’s Dragon Quest Heroes sequel is officially headed to the PS4 early next year. 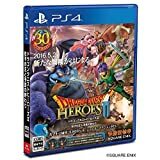 Scheduled to launch on April 25th, 2017, the bigger and better Dragon Quest Heroes II looks like a ton of fun and features a pair of new heroes to play as. The game apparently improves on the original in quite a few ways, so we’re definitely excited for it. More game details are coming soon, but for now, have a look at the announcement trailer below. Read on for the announcement, with story details too. SQUARE ENIX announced today that DRAGON QUEST HEROES II will launch in North America on April 25, 2017. DRAGON QUEST HEROES II brings together a cast of numerous unique characters each with unique moves and abilities, including a host of familiar faces from the DRAGON QUEST series and two brand-new heroes to choose from – cousins Lazarel and Teresa. Watch the opening cinematic of DRAGON QUEST HEROES II at: https://youtu.be/I1vUazmiL5U.